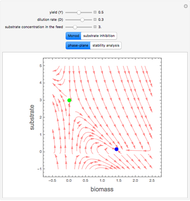 A biochemical reactor can show complex dynamic behavior, including multiple steady states. 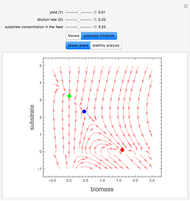 This Demonstration plots the phase-plane diagram and computes the stability of the steady states. 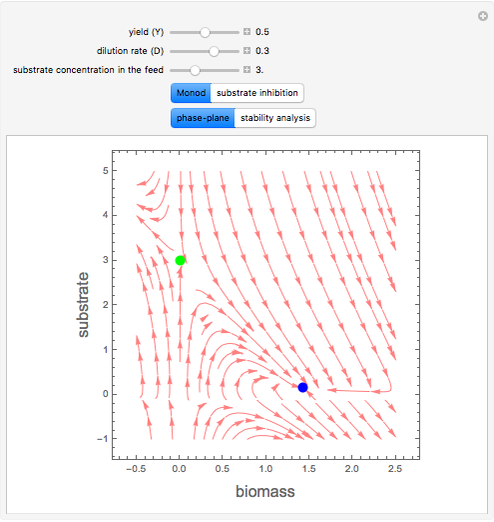 You can choose either the Monod model or the substrate inhibition model for the growth rate expression. Parameters of the specific growth rate expression are taken from . 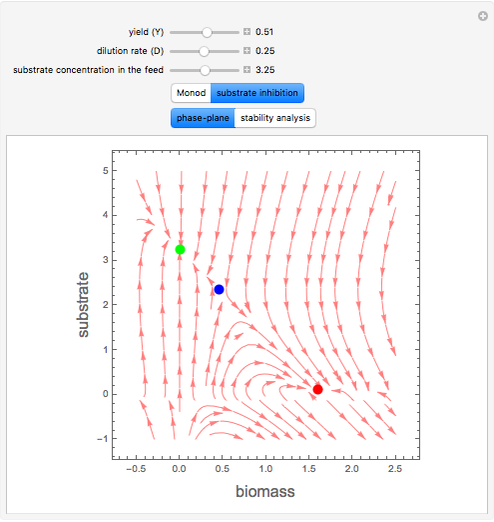 You can select numerical values for the yield, dilution rate, and substrate concentration in the feed stream. The Monod model has two steady states, which are indicated in the phase-plane diagram by the green and blue dots. As you can see in Snapshot 1, the green and the blue steady states are a saddle point and a stable node, respectively. The eigenvalues of the Jacobian matrix confirm this observation (see Snapshot 3, where and are the two eigenvalues for the steady states). Each steady state ( ) is defined by its two coordinates ( and ). 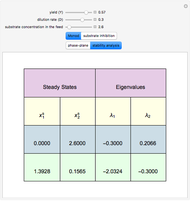 If both eigenvalues are negative, then the steady state is a stable node. If the eigenvalues have opposite signs, then the steady state is a saddle point and is unstable. Finally, if both eigenvalues are positive, the steady state is an unstable node. The green steady state corresponds to washout (i.e., no biomass is left in the bioreactor). 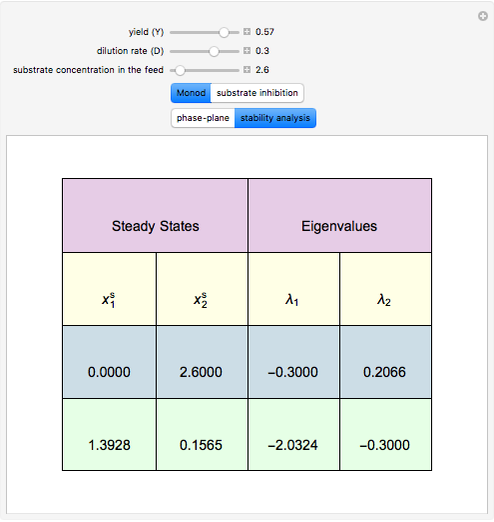 When the substrate inhibition model is used, up to three steady states are obtained. These steady states are indicated by the red, green, and blue dots. The stability analysis (i.e., determined by the signs of the Jacobian matrix eigenvalues) indicates that the steady states given by the blue and red dots are stable, while the one represented by the green dot is a saddle point (see Snapshot 2). Again, a simple eigenvalue computation for the Jacobian matrix confirms this observation (see Snapshot 4, where and are the two eigenvalues). Here, the red steady state corresponds to the washout. where is the biomass concentration, is the substrate concentration, is the dilution rate, is the yield, is the feed substrate concentration, and is the specific growth coefficient. Here, , , are taken from . B. Wayne Bequette, Process Dynamics, Modeling, Analysis, and Simulation, Upper Saddle River, NJ: Prentice Hall, 1998. Housam Binous, Brian G. Higgins, and Ahmed Bellagi "Phase-Plane Analysis of a Biochemical Reactor"